What is your first memory linked to design ? Carlo Massoud (CM) As a kid I used to dismantle and assemble stuff in different ways. I was always looking for innovative solutions and new shapes. When I enrolled at the Lebanese Acadamy of Fine Arts in product design I didn't know how to draw in 3D at that time but that quickly changed. I was passionate and curious about every object and project, trying to understand how it was made, what the materials used were, etc. CM When I work on a specific project every material gives me joy. In general I like materials that take shape with fire (such as ceramic, glass, melted metals like bronze, brass, ...) Each one has its challenges and specificities. Each time that I seek to push the limits of the material it results in a new discovery. Can you describe your project for this event in a few words? I undertook a collaboration with blind people who work with wicker. The main challenge was to work on a steel chair and experiment with the process. The third is a series of candle holders in bead-blasted stainless steel and marble. What is your first memory linked to design? Paola Sakr (PS) My first memory related to design would probably be when I was around nine years old while moving houses in Beirut. My mother had given me complete liberty to design my bedroom. I had worked on every last detail of the space and had hand-drawn all the furniture. I remember being utterly amazed to see my drawings come to life, and I instantly fell in love with creating. PS As someone whose main focus is experimenting with material innovation and blending materials together, I can never choose just one. What interests me is creating dialogues between materials with very different identities in terms of visual feeling and also manufacturing processes. Since for me it's phases of interest, I can say that I have a newfound love for stone and ceramics for their rawness, as well as textile for versatility. PS I have great admiration for Japanese designers such as (but not limited to) Naoto Fukasawa, Nendo, and Kenya Hara, for their unbeatable minimalistic visions and perfect execution of projects. Can you describe your project for M&O in a few words? PS I will be exhibiting my two projects, Morning Ritual and Impermanence, as well as a new collection I'm working on for the show, which will be the result of my very first encounter and experimentations with ceramics. Marc Dibeh (MD) My first memory linked to design could be the first time that I wondered about everyday products and who was behind them. MD I am interested—and also intrigued and inspired—by all kinds of materials. Starting with my narrative of an object's coherence and/or its construction, the choice of material can be suggested by the object's form. However, sometimes exploring a project to its limits can also lead to seeing new possibilities in a material. Often I find that meeting with experts in different fields can lead to new ideas on this. MD That is a hard question to answer, there are so many.... I admire some of them for their mastery of spontaneous gesture, and others for their creative processes. The discipline has brought to light certain iconic figures, who are certainly influential though not uncontested. And real talents are emerging all of the time. Can you describe your project at M&O in a few words? MD It will present several objects from different collections. Some of them belong to a series for Joy Mardini Design Gallery in Beirut and are the expression of well-crafted narratives that I will leave you to discover. 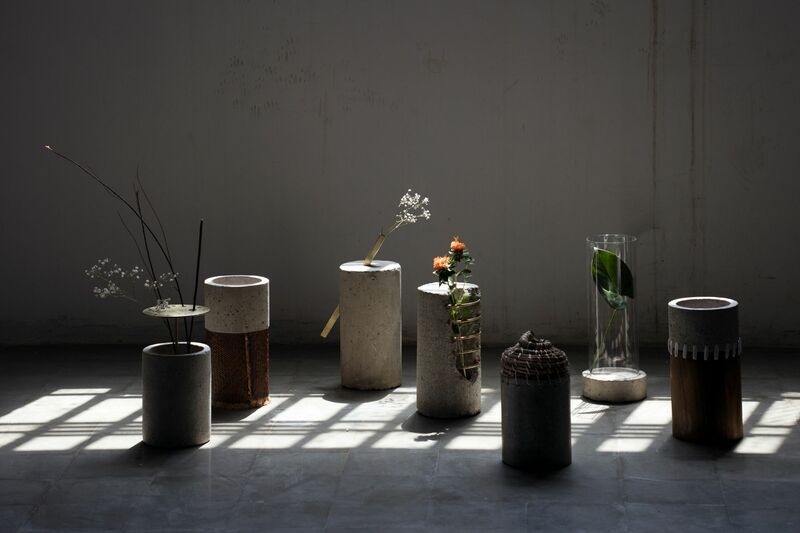 The remaining objects, which have never before been exhibited, result from a desire to work with terrazzo and explore its multiple dimensions. Making choices also requires you to give up on other possibilities. I am hoping to inspire people to discover my other works and projects. Anastasia Nysten (AN) I've always loved making things, decomposing objects, rebuilding them....I used to make miniature furniture when I was a child. I didn't quite think I would continue doing that later in life but it's just something I never gave up doing. Sketching and making mock-ups becomes an addiction. AN I like natural materials, materials that age well like wood, metal, stone... I've always been fascinated by timeless objects and how the design has survived the test of time. AN I've developed a collection derived from the concept of the Troll Chair I created last September. The Troll Chair is an exercise of revisiting the composition of a seater, what we already know. It is somewhere between a bean bag and an armchair that I've decomposed and reassembled as to come up with a skeleton holding a fleshy pillow. Studio Caramel (SM) Our first memory would be the first conversation we ever had together in 2010. We recognized each other from school but weren't really acquainted with each other. Our conversation was about the reason why we decided to study interior architecture and to our surprise, we both had the exact same answer to the question. It is no surprise that we reconnected after all this time to found Studio Caramel together. SC Wood would be our favorite material as we almost always use it in our designs. Surprisingly enough, we used this material very little in our new collection for the upcoming Maison & Objet. SC This is one of the hardest questions. It is very difficult for us to decide on one favorite designer. We like many designers for many different aspects: India Mahdavi for her exquisite use of color, Gabriella Crespi for her Bohemian-chic touch with brass as the material of choice, Jean Prouvé for his functional yet industrial way of designing and many more.